We don't assemble the LED strip lights with power cord for different length requirements. It's very easy to assemble it by following our instruction. Yes, Shine Decor is from China, BUT we don't like price war, short high profit with poor quality and vicious competition. We like just keep quiet, focus on our products, our customers, our technology. And we did like this in the past 14years at Lighting business. Most of our clients have been cooperated with us more than 10 years, though they know we are not the CHEAPEST supplier. No Transformer Is Needed. Water Resistant. All necessary accessories included. Warning: This warm white strip light is made by YELLOWISH 3000K WARM WHITE LED, same color as our picture. WARRANTY: Shine Decor® is a manufacturer brand from China, which has been in LED lighting products since 2004. We have warehouse in US and offer immediately after-sales service. 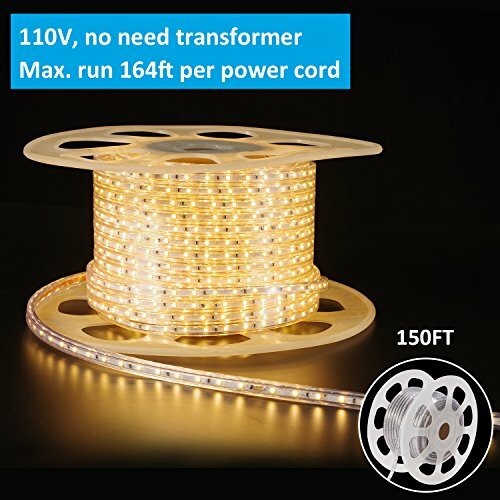 All our LED strip lights come with a 1-year warranty, if you are not satisfied with our products, please contact us by "shine-decor lighting", we will respond you in 24-hours. ACCESSORIES INCLUDE: lead wire with 8A convertor UL standard plug, end cap, connect wire, heat-shrinkable tube.